I received this LP as a gift from Jeff Joseph of Joseph Audio when I visited him last month in Long Island. Jeff loves this recording so much that he bought a bunch of sealed copies, and occasionally he gives them out as gifts (I'm one of the lucky ones!). This was on the Harry Pearson's TAS list for many years, and after a few listens it's easy to see why. Once you start listening, however, you'll be amazed at the superbly lineated soundstage, especially from front to back. 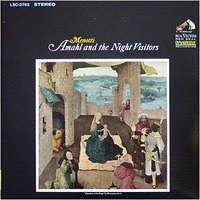 A children's opera about the arrival of the Three Wise Men, Amahl and the Night Visitors is a production that requires a lot of movement on the stage, and I've never heard a recording that tracks its performers with this level of precision. In other words, you'll know EXACTLY where everyone is as they sing and walk and turn and interact with each other. I first heard this LP at Jeff's factory sound room which consists of a VPI TNT turntable and arm, a Cardas Heart cartridge, Bel Canto electronics and of course a pair of Joseph Audio speakers--in this case Jeff's flagship Pearls. It was a stunning experience, and I was duly impressed in every way. Now that I can listen to this gem in my own system--a perfectly mint version to be exact--I feel blessed. If you find a copy in good condition, I heartily recommend it. Cu-Avana Punisher...not for the faint-hearted! Brand new Rega P3...the RP3!